Home > Items just added 4/3-4/17 > (M) Vintage 70s Work Shirt! Yellow w/ Green Lettering "Lathrop Feed & Equipment Casper Wyo" As-Is! Mens vintage 1970s vintage work shirt! 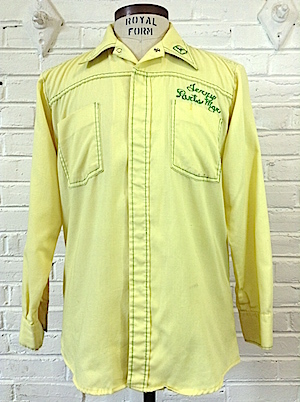 Bright yellow shirt with green topstitching and John Deer Symbol. 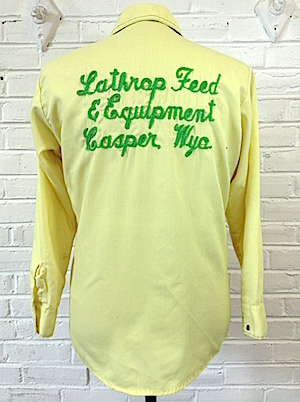 Back of the shirt is embroidered in bright green with the words "Lathrop Feed & Equipment Casper Wyo." On the front of the shirt. 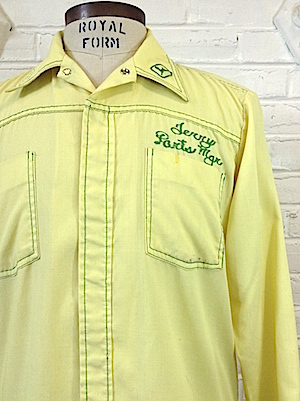 Above the front,left pocket "Jerry Parts Mgr" is embroidered in bright green. Has an extra wide and point 70s collar. Closes in the front with snaps hidden below the placket with one snap with a green and silver colored top on each cuff. Two patch pockets on the chest. Shirt has a tapered hem. Tagged by Protexall. Polyester/Cotton blend. Made in the U.S.A. Condition: Good++. Has some gray-ish stains on the back of each of the sleeves and another gray-ish stain on the left, front of the shirt. Has some red-ish staining on the left pocket as well. Still an awesome vintage work shirt! Priced accordingly.